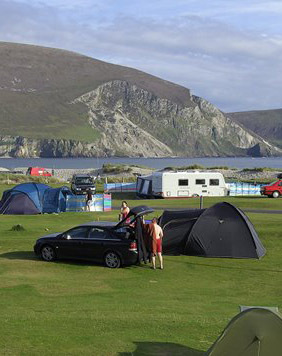 Keel Sandybanks Caravan & Camping Park is a 4 Star family run caravan & camping park, located on Keel Beach on Achill Island, Co. Mayo in the West of Ireland. The park provides full services for camping and caravanning. Modern mobile homes are also available for hire. Bridge linked to mainland Mayo, Achill Island offers a variety of scenic beauty and a range of holiday opportunities. Camping: Keel Sandybanks Caravan & Camping Park provide a variety of pitches to suit all needs from camping pitches to powered hard-stands in spectacular surroundings. With Tramore Strand to the south, Slievemore mountain to the north, the Minaun cliffs to the west and Keel village to the east, the location simply cannot be beaten. The park facilities are always maintained to the highest standards and provide everything you need for your holiday. We are a dog friendly campsite, once the dog owner picks up after the dog and ensures that it is kept on a lead and not allowed to roam freely. With direct access from the park onto Keel Beach (5km), it is ideal for dog lovers. Check in is accepted up until 22:00, check out is 12:00. Reservations required for group bookings. Unfortunately we cannot accommodate a Gazebo/Shelter.